Location: 50.763415, -1.997767; SZ-00254-95981 Front garden of 5 Higher Blandford Road. Estimated Age: 243 years. Planting year: 1767. Covered by area T.P.O: #9 registered 7 June 1955. 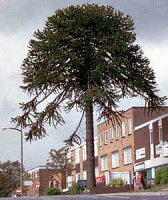 Araucaria Araucana; Chilean Pine; National Tree of Chile. Location: 50.759521,-1.993736; SZ-00538-95547. On Broadway next to Stepping Stones. Estimated Age: 113 years. Planting year: 1897. 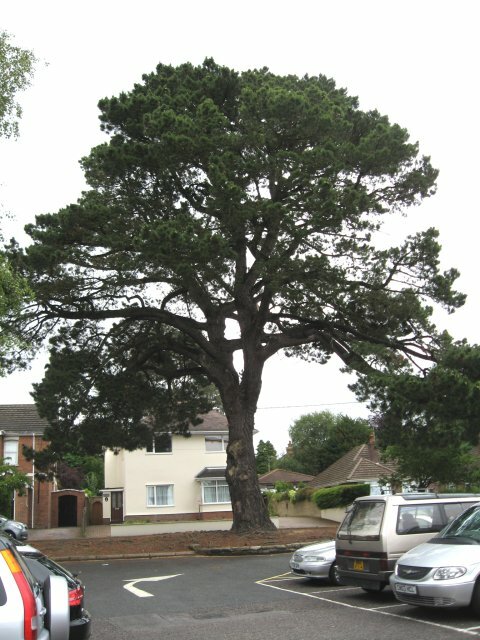 Probably planted in 19th Century in front garden of Burton House, since knocked down and replaced by shops and carpark. 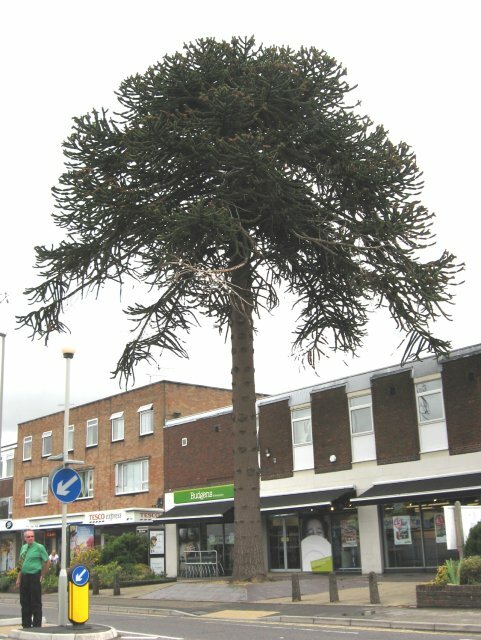 This tree is the landmark for the Broadway, Broadstone's main shopping centre, when climbing the long, steep hill from Poole. It should be placed on Broadstone's crest. The male and female cones are on different trees, which Gender is this? Before the trees regular "trim" to give it a more pleasing appearance. The council do a good job. Location: 50.767251, -2.000361; SZ-0007-9640. Garden of 73 Higher Blandford Rd. Girth=5.60 metres @ 2 metres. Covered by Area T.P.O #9 registered 7 June 1955. Growing in the garden of Home Cottage, it may have been planted by Miss Cotton (ref nearby Cotton Close). The species was introduced into the UK after 1853 from California. Location: 50.773026; -1.983985; SZ-01226-97049. In Delph Woods. Girth=4.70 metres @ 1.5 metres. Estimated Age: 281 years. Planting year: 1729. Not covered by any known T.P.O. A fine symmetrical tree, in the centre of a circular clearing, about 150 metres South of the end car park on the access track to Delph Woods. The canopy (larger than most at 31m x 23m) stands out clearly on Google Earth, and allows an accurate location. The girth indicates an age of 400 years, and the canopy symmetry may mean a very old clearing too. 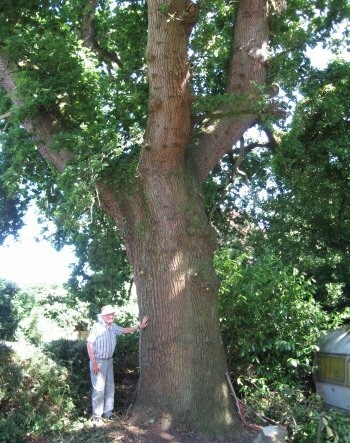 However, another view states: "you can't miss the magnificent 200 year old common Oak standing 80 feet high with a circumference of just over 13 feet, the foliage in the summer is so dense that nothing grows under it"
Girth=2.90 metres @ 1.0 metre. 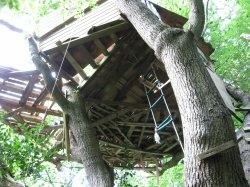 A good size oak, maybe in the back garden of 51 Upton Way, large tree house built in the branches, falling to bits, maybe the children have grown up? Location: 50.753204, -1.996008; SZ-00378-94845. Edge of Hillbourne Copse. Girth=4.70 metres @ 1.0 metre. Estimated Age: 218 years. Planting year: 1792. 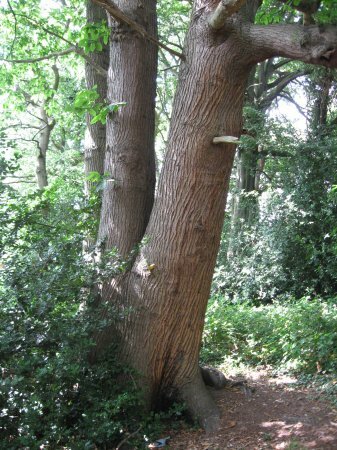 This may be two trees that have grown together, but more likely to be two stems grown from one root, as often happens. Right on the (wrigly) border of BH18. Location: 50.754061, -1.992832; SZ-00602-94940. Edge of Pocket Park. Girth=3.97 metres @ 1.5 metre. Estimated Age: 214 years. Planting year: 1796. 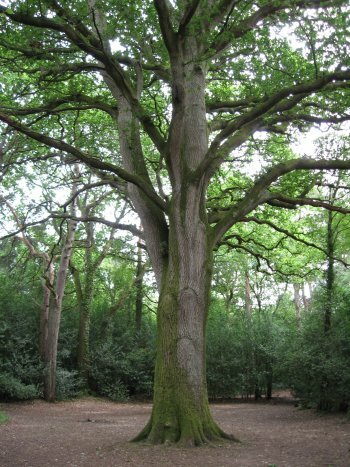 A big oak that has lost its leader early in life, the 4 main branches taking over its role. The brook under the footbridge may have helped swell its size. 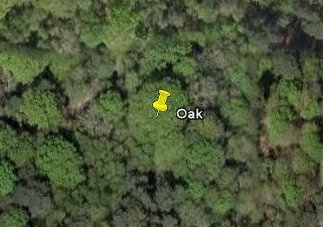 Located a few yards inside the BH18 boundary, in a line of slightly lesser oaks. Location: 50.765029, -1.982194; SZ-01352-96160. Cemetery off Dunyeats Rd. An unusual grave in Broadstone Cemetery, restored by the A. R. Wallace Memorial Fund in 2000. 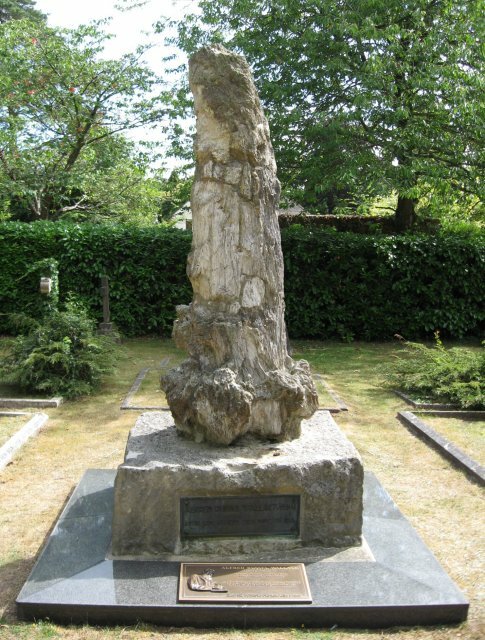 It features a 7-foot (2.1 m) tall fossil tree trunk from Portland mounted on a block of Purbeck limestone. Alfred Russel Wallace, OM, FRS (8 January 1823 � 7 November 1913) was a British naturalist, explorer, geographer, anthropologist and biologist. He is best known for independently proposing a theory of evolution of species by natural selection that prompted Charles Darwin to publish his own theory jointly with Wallace in 1858. Wallace lived in Old Orchard, a house he designed himself (1901), built in 1902, knocked down , in 1964, which stood where Wallace Road now stands. 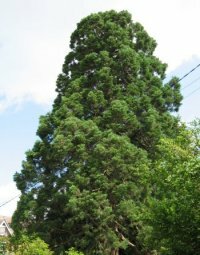 The age of the tree is late Jurassic, about 150 million years old. The grave is located 50 metres beyond the main gate, on the right, very obvious. "Dr Paul Kenrick of The Natural History Museum, London, examined a small fragment of the fossil wood from the grave monument using a scanning electron microscope and found that the wood has tracheids with closely spaced pits, similar to those known from Protocupressinoxylon purbeckensis Francis, an approximately 146 million years old conifer of the subfamily Cheirolepidiaceae, found in the Lower Purbeck Formation (Lower Dirt Bed or Great Dirt Bed) in the Portland/Swanage area of Dorset." "It is known that Wallace accompanied the American Palaeontologist Lester F. Ward on a field trip to the Isle of Portland in 1894 to collect fossil wood (see Ward, 1896) and one of the species collected on this trip was even named Araucarioxylon wallacei Knowlton after him. Interestingly, several pieces of fossil wood were found in the garden of Old Orchard after Wallace died by the Tyndale-Biscoe family, who rented the house from Wallace's son in 1916 (the late Mrs Barbara Waterman nee Tyndale-Biscoe pers. comm.). These fragments, although smaller, were very similar in appearance to the fossil on Wallace's grave, so it is possible that the trunk on the grave was collected by Wallace and that it was taken from Old Orchard following his death." 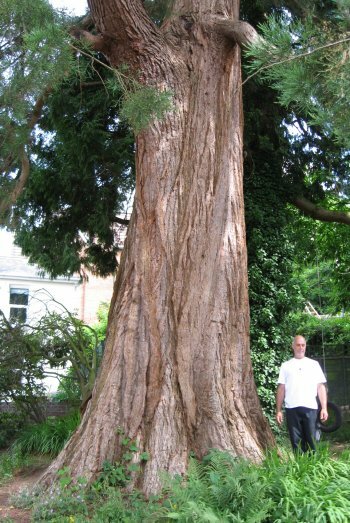 From: Fossil tree on Alfred Russell Wallace website. Location: 50.765306, -2.004202; SY-99800-96191. Front Garden of 2 Lancaster Drive. 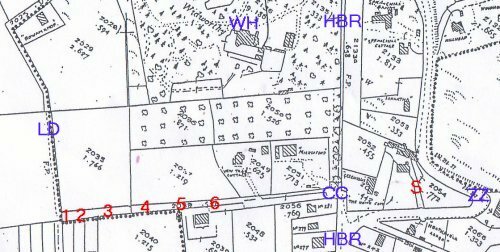 The right of way which appears on this TPO map of 1955 once formed a boundary to land around Widworthy House (WH), owned by Lionel Cotton, a local solicitor. The big house has now been replaced by 3 small modern houses, but the foundation wall is still visible, and the right of way is now part of Cotton Close (CC) The line of pines is now where back gardens of bungalows meet. It is said that Miss Cotton (dau of Lionel) used to walk the right of way regularly to keep it open. Location: 50.751944, -2.011657; SY-99274-94705 on Pinesprings Place Local Nature Reserve. Girth @ 0.5m = 4.40m. Estimated Age: 252 years. Planting year: 1758. 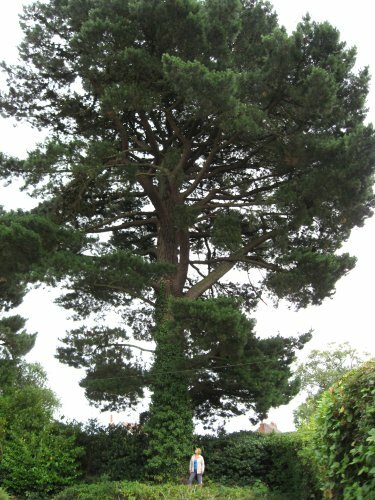 A large tree in Pinesprings Place Local Nature Reserve, on the wooded western edge of a grassy triangle, easily reached by the public footpath from Pinesprings Drive. The low fork appears to be totally natural, and the tree-form to be maiden rather than multi-stem. The girth was measured at only 0.5 metres, so the calculated age is probably too old. "Situated in a small piece of deciduous woodland on Pinesprings Place Local Nature Reserve. The following notes describe its role as a keystone species in the ecology of the nature reserve. 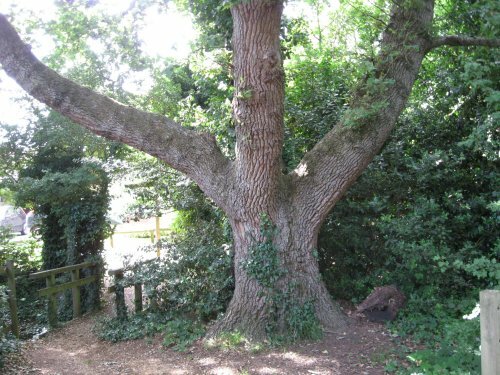 The oak tree was leaning on a slope and hence covered a greater area than if it had been upright. It was linked to the wildlife of the other habitats of the Reserve, (meadow, scrub, wet heath), both in terms of the structure and Ecology of the Reserve. 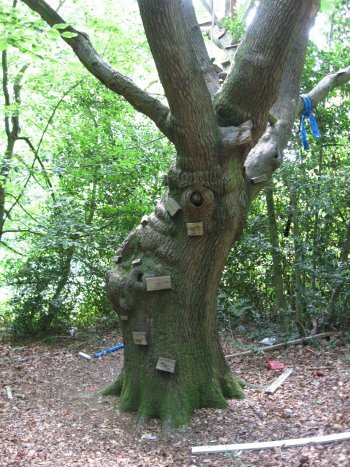 During the years of 2005 to 2006 the Jay and the Great Spotted Woodpecker used the structure of the tree as nesting sites. 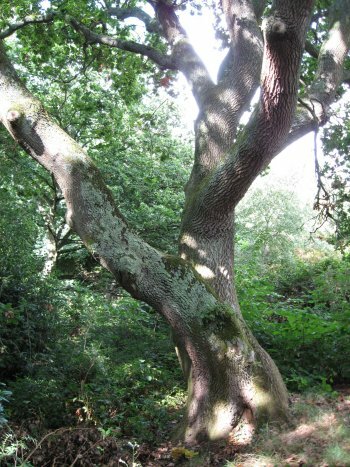 In terms of ecology, during the same period, the oak trees on the Reserve had a more intimate relationship with the 67 species listed in the Table. In theory, the oak tree is host to 284 species of insects in Britain (Southwood 1961) so the figure of 27 insect species on this reserve represents 10% of the possible number that could be present."